Carolina Panthers quarterback Cam Newton was taken to hospital with fractures to his lower back after a two-vehicle crash. The full extent of the 25-year-old NFL star's injuries are unclear. Newton was seen smiling before being placed into an ambulance in a neck brace after the accident in Charlotte, North Carolina. The Panthers tweeted: "Cam is in fair condition and undergoing tests. He will remain in hospital for observation." 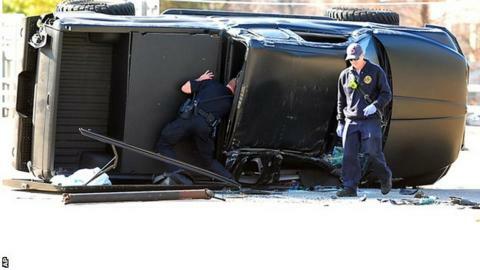 Police said a black pick-up truck driven by Newton had overturned, with debris scattered over the road surface near Carolina's Bank of America Stadium. The roof of the truck was caved in and another car that appeared to be involved in the crash had front-end damage. Newton was taken to the Carolinas Medical Center for treatment. The Panther statement added: "Further testing revealed that Cam has two process fractures in his lower back and no further internal injuries." Newton, the number one overall pick in the 2011 NFL draft, has missed only one game this season. Newton has one year left on his rookie contract after the Panthers picked up a £9.6m ($15m) option for 2015. The Panthers are third in the NFC South, having won four, lost eight and tied one. They are next in action against Tampa Bay on Sunday.